Soundbyte – Podcast / Audio WordPress Theme- Show off your work with this easy-to-customize and full-featured WordPress Theme. When purchasing this theme, you will receive a detailed help file along with additional features like an Audio Player and Drag & Drop Page Builder. MultiPress – Multi-Purpose WordPress Theme is a tasteful and well-designed theme that you can use for constructing a beautiful and fully functional website, with 8 Unique Theme Layouts and an unbranded admin Theme Options panel that gives you full control of the customization of your website: MultiPress Corporate, MultiPress Corporate 2, MultiPress Business, MultiPress Startup, MultiPress Band, MultiPress Blog Magazine, MultiPress Blog Ultimate, MultiPress Blog Dark. BuildWall – Construction Company Multipurpose WordPress Theme is crafted with attention to details and functionality! The theme contains 6 gorgeous skins dedicated to construction business with various designs and elements. With BuildWall you will be able to manage and customize your content with powerful drag and drop Elementor page builder. It allows setting up information without any coding skills. 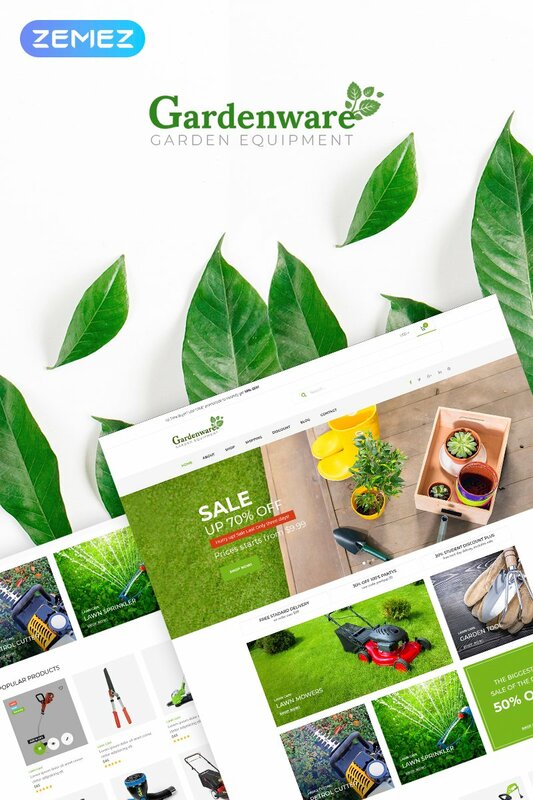 Gardenware – Garden Equipment WooCommerce Theme will make your landscaping equipment website really fresh and unique. With this theme you’ll get different layouts with adjustable pages with multiple changeable elements to make your future website really fit your expectations. This WordPress theme offers nearly endless website customization possibilities with various headers, footers and post formats. Being based on WordPress, this theme also provides blogging features. Crypto – A Bitcoin & Cryptocurrency WordPress Theme is the perfect theme for cryptocurrency based blogs. Apart from regular blogging features, Crypto has many specific features for cryptocurrencies that make it the most sought-after cryptocurrency theme by crypto bloggers, traders, commentators, and spectators. It provides multiple ways of monetization and can be used to cover blockchain, BitCoin, AltCoins and any other topic from the cryptocurrency world. MultiDot – multi-purpose WordPress theme is a beautiful theme for building a stylish website, whatever your industry. It would be an excellent base for any website, large or small. It’s entirely responsive, has a drag-and-drop page builder, can be easily translated, and can work for any industry or niche. MultiDot comes with everything you’d expect from a WordPress theme that’s designed to make it easy to create a flexible, robust website. ProMotionic – Promotion Agency WordPress Theme is for advertising agencies. It includes a huge number of page layouts and beautiful icons. The key advantages of ProMotionic are lightness, user-friendly perception, high speed, SEO-friendly code, and optimization of each page for search engines. Also, adaptation for mobile devices, and support for a number of premium plugins like WooCommerce, Elementor Page Builder, and others. JuicySport – Sport Accessories WooCommerce Theme is fast and flexible. It meets modern trends in web design and has a user-friendly interface. The theme includes layouts for women’s and men’s sports clothing, footwear, and accessories. Among the built-in plugins there is a visual designer, a slider and an extension for WooCoommerce support. Also, there are several options for the catalog and pages for individual products. Theme supports mega menu. CHERRY THEME – MARKETPLACE WORDPRESS THEME is a flexible shop & business WordPress EDD Theme offering deep integration with Easy Digital Downloads. It’s perfect to create your self-hosted online shop to sell the digital products like software, photography, videos, audios, eBook or graphic design works, etc. Either multi-product shop or single product website can be set up easily with Cherry Theme. We believe Cherry Theme will be one of the best Easy Digital Downloads Theme for your next project!. CREATIVE CORE – Original WordPress Theme is developed for FOR ANY DIGITAL AGENCY. Digital marketing agencies, SEO companies and social media specialists will find in The Core a perfect WordPress theme for their websites. The Creative Core theme is a multi purpose innovative template that comes prepacked with all the features you expect from a modern template. Once uploaded, you can manipulate the design however you want by simply using the advanced drag & drop visual builder. Styled Fashion Agency & Shop WP Theme is a great theme for those looking to build an attractive and engaging website that stands out for fashion agencies, cosmetics, magazine, music, movies and many more types of websites. Designed and coded to work flawless with WooCommerce you can build your eCommerce website easily. Styled is tested through multiple devices. Be it a desktop, notebook, tablet or mobile phone, Styled comes with a fluid layout that adapts well across devices. Styled comes with a powerful Home Page template that enables you to display featured content while keeping the clean look. Traveler Blog WordPress Theme is a beautiful and modern theme, designed specifically for the travel blogger. The elegant, grid-based layout puts the focus on your featured images. The different post types allow you to choose the best way to display your photos and articles. This theme is perfect for image-heavy blogs. Travel expands the mind and inspires us to be worldly people, and what better way to document your travel life and fondest memories than with this stunning modern WordPress design. Traveler WordPress theme is not just a template, it’s a collection of amazing examples with tons of features. IGNIS PRO portfolio WordPress theme builds on the free theme Ignis, adding many new and exciting features. Ignis Pro is a flexible theme that will help you take your online portfolio to the next level. The main part of Ignis, the portfolio, is easily managed with Jetpack’s portfolio custom post type. Choose from up to five portfolio layouts for your homepage to really stand out from the crowd. With Ignis Pro you get your choice of header. It can be a slider, a static image, a video or even a shortcode for your favourite plugin. WpOutlaw – Stylish WooCommerce WordPress Theme is a creative WooCommerce theme that has class and style. Designed with smooth visuals and creative lines, Outlaw will showcase your products breathtaking ways. Packed with user friendly high quality elements, you can be sure that Outlaw will give your ecommerce site striking aesthetics and usability. The theme comes with a powerful easy to use options panel that lets you customize the site to exactly how you like it. Unlimited color and font combinations are possible with the theme so you are free to let your creative juices flow. With TURNER – CONSTRUCTION WORDPRESS THEME you will be able to set up an effective presentation of your brand in an extremely short amount of time and without any difficulty whatsoever! Your website will be available on all known devices and all over the world. Feel like changing the appearance of your website? We present you with an extremely customizable, responsive design bound to satisfy your clients! Feel like sharing your thoughts with customers? Use trusty Personal Blog feature. In a need to choose a new text style for your website? Corti – Multi-Concept WordPress Theme is a Responsive Multi-Concept WordPress Theme built using HTML5/CSS3 features and suitable for creative companies, agencies, and freelancers which need a professional way to showcase their projects, services, and sell their products. It is a fully responsive and retina ready so it works nicely on Smartphone, tablet PCs and desktops. We built octa with the latest Bootstrap responsive framework, because we want our customers would find a light awesome, powerful, and easy to use theme. DENTALCARE – DENTAL CLINIC WORDPRESS THEME is a clean and modern WordPress theme designed specially for dentists, dental practices, dental clinics, dental hygienists, orthodontists, endodontists, health clinics, doctors, oral health care providers and any other health and medical organization. Dental Care features a responsive mobile ready design powered by Bootstrap 3 that looks great on all devices. There are so many shortcodes and widgets to manage the theme, as well as Visual Composer that helps you build your own page layouts. The theme is totally responsive, WPML and SEO ready, has One Click demo data installation and is compatible with cool premium plugins: Revolution Slider, WooCommerce etc. CAR REPAIR – AUTO MECHANIC WORDPRESS THEME was created for car repair, auto mechanics, car wash services, garages, auto blogs, and other websites related to vehicles maintenance. The theme has an attractive layout that will perfectly fit for your car repair business – there are so many shortcodes and widgets to manage the theme, as well as Visual Composer that helps you build your own page layouts. Metro – colorful WordPress theme comes with 9 different colors based on Windows 8’s Metro that you can apply to all or individually to all blog, Tile, and Portfolio posts. Inspired by Windows 8, Metro is a responsive, beautiful, minimal, and colorful theme that is perfect for blog and portfolio sites. Using the Tile custom post type, you can mimic the Metro design by showing various tiles: buttons, gallery sliders, images, maps, and text. Showcase your portfolio with either a single featured image or an image slider. Make your blog interesting by publishing different post formats such as: images, videos, quotes, galleries, links, etc. Agency – WordPress theme is clean, minimal, and responsive theme meant for design agencies. Agency is a corporate theme that allows design agencies to easily showcase their design portfolio, display their products and service offerings, provide social proof through customer testimonials, and display the hard working people on their team. Fully customizable using the Themify shortcode convention, allowing complete freedom in how the website behaves and displays itself across any and all devices. Simple – free WordPress theme is built exactly what it is named for: simplicity. The simple design is built around to add a Shopify store on your WordPress site using the free Shopify Buy Button plugin, but is flexible enough for any regular blog or static pages. Simple is built and designed specifically for use with the Shopify Buy Button plugin, from Themify, to simply turn your WordPress site into a store front, where customers can easily buy items without having to redirect to Shopify. Responz – responsive WordPress theme is a 3-column theme for news and editorial sites. The design is minimal and elegant with great typography. It looks great on any resolution on desktop and mobile devices such as iPad, iPhone, Android, and Blackberry. There are many layout options built in Responz. You can choose from 2 sidebars, 1 sidebar, or fullwidth along with various list view and grid view post layouts. The sidebars can be on the right side or left side. It is very flexible and highly customizable. iTheme2 – WordPress Theme is a revamp of iTheme that was originally released by Nick La. Now with the Themify framework, it is even better and have more options. It is the perfect theme for technology & Mac related blogs. It uses media queries to target different displays such as desktop, notebook, iPhone, iPad, and other mobile devices.